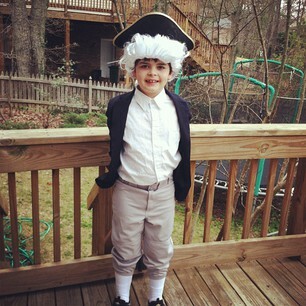 This morning I dropped Nathaniel off at school dressed as George Washington. 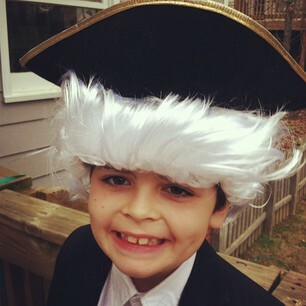 He had to memorize a brief biography of Washington and recite it to his class between 8:15 and 9 a.m.
That is precisely the sort of assignment that left me in a state of absolute anxiety when I was his age (OH WHO AM I KIDDING? I would have freaked out if I'd had to do it last week, too), so I was really proud of him for memorizing his speech so well and not being nervous when we left the house today. Many thanks to my friends Lisa and Ashley for the costume loaner. Adorable!!! I'm sure he did fantastic! Hammond’s son Travis states in court 18 Apr 1833 in Union County Illinois in a pension hearing relative to the battle of Brandywine that “… he was young, careless and thoughtless and knew no other officers except his Captain and General Washington with whom he was particularly acquainted, as his father once lived a neighbor to the General, previous to his turning out under him.” One land grant of Hammond’s great, great, great grandfather Nicholas Morris extended to Stony Point, in now Westmoreland County. Stony Point was the girlhood home of Mary Ball mother of George Washington. He looks so cute. Enjoyed the comment by Chris. It's great to add family history notes, especially with kids. My family is related to President Wilson, so my girls love doing family tree research even now.